Khalifa Port in Abu Dhabi, UAE, has hit a milestone for port productivity with the truck turnaround time at the port’s semi-automated container terminal dropping to just 12 minutes, making the terminal the most efficient in the region. The port’s container terminal, which is operated by Abu Dhabi Ports Company’s (ADPC) subsidiary Abu Dhabi Terminals (ADT), started off with a truck turnaround time of around 40 minutes at the beginning of commercial operations in September 2012. The latest turnaround record of 12 minutes marks a 70 per cent time reduction in just two years. The turnaround time of a truck picking up or dropping off its cargo from or at a container terminal is calculated over two time periods: the waiting period of a truck outside the port gate before entering the port and the time spent by a truck inside the port from entry gate to exit gate. Congestion is a common problem for ports around the world, it can be caused by many trucks arriving at the same time to drop off or pick up their cargo. Other challenges are that truck drivers need to go through security checks before entering the port or are not familiar with the port premises. Apart from optimising the system interfaces with the automated stacking cranes (ASC) which organise the containers in the container yard, another reason behind the drastic time reduction is ADT’s strong emphasis on training truck drivers how to use the semi-automated container terminal and making them familiar with all of its facilities, it said. In addition, Khalifa Port is equipped with a comprehensive, state-of-the-art information and communications technology system that allows ADT to constantly optimise operations on the port site. Part of this cutting edge ICT system is an appointment application through which truck drivers register online and choose a preferred time window to drop off or pick up a container. This enables ADT personnel to organise truck arrivals and container cargo ahead of time. Against this backdrop, ADT has further improved the coordination between staff members at Khalifa Port’s container depot and ADPC. Khalifa Port’s master developer has invested in additional Automatic Stacking Cranes (ASCs) at the port’s container yard, bringing it to a total of 42 ASCs. Furthermore, ADPC has introduced optical character recognition (OCR), as well as RFID (radio frequency ID) tags for truck drivers to make their entry to and exit from the port faster and more convenient. 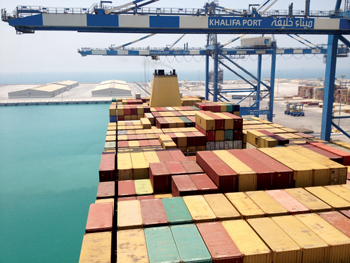 “The 12-minute benchmark adds another success story to Khalifa Port’s container terminal. It is a world-class achievement and the result of our excellent partnerships with our customers who had a tremendous impact on the improvement of our traffic management,” said Ahmed Al Mutawa, director, container terminal operations, ADT. “A quick truck turnaround time is very important for our customers as it affects their supply chain efficiency. Achieving a 12-minute turnaround time for trucks is a fantastic result which raises Khalifa Port’s status as an international maritime hub, driving trade and economic prosperity across the emirate,” said Gary Lemke, executive vice president for ports, ADPC.